What types of meditation are there? Many, but I think I have a framework that can help to simplify the issue. You have two basic choices. The first is between sensation and imagination. You can either feel what your body is experiencing, or you can play with the images and impressions that are in your mind. The second choice is between directing your attention and not directing your attention. You can either focus, or just let what happens happen. 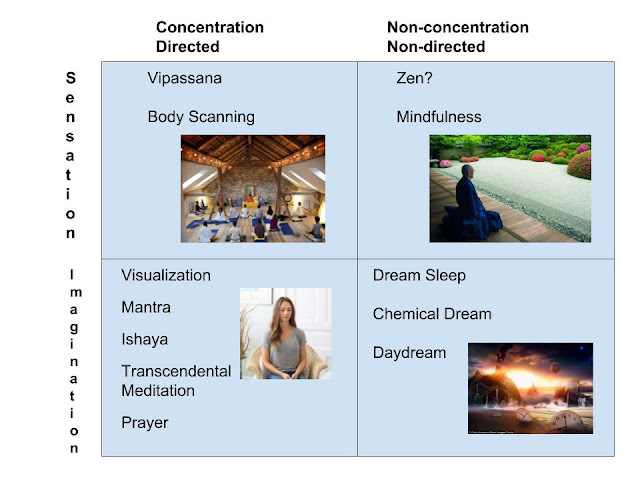 These two choices form four basic quadrants of meditation. I'll give quick examples of how each works. When my C1 vertebrae slid into my brainstem in late 2015 I had major issues. One issue was that I didn't even know I had spinal deformities, and I still wouldn't know for another few months. I was still trying to figure out what had gone so wrong in Africa and how to fix it. The pain though, the pain was a constant. Every system in my body was thrown way off. As you're losing your short term and long term memory, are in constant pain, and have to sleep almost the entire day, it's very difficult to problem solve. I tried a bunch of things and slowly started making progress by trial and error, but I couldn't get a good grip on the pain issue. In 2017 I had made some decent progress. Earlier I couldn't walk across the street and get the mail without taking a few stops to catch my breath. Now I could get the mail without making a single stop. I decided to do an intense experiment in an attempt to work on the pain issue. I did a ten-day silent meditation retreat. It was insane. I was sensitive to light and sound, had a constant migraine, and all of my joints were always in pain, especially my spine. In this Vipassana method if you're in pain you lean into it. You try to focus on feeling and experiencing it. It's intense. I thought about quitting, but if I quit I would still just be in constant pain with no change, so there wasn't really an advantage to me quitting. I stayed with it, and on the third day of about ten hours of meditation a day I had a major transformation. I've never experienced pain in the same way again. It permanently changed my experience of pain. The basic idea in directed sensation meditation is that you move your attention to an area of your body and feel that. That's it. This can be done in a number of different ways. You can try to expand the area, or move the center of attention in certain patterns. This type of thing is called body scanning. Some methods focus on one specific thing like feeling the breath in the nose, or feeling the breath in the belly, or feeling the heartbeat. These are all different versions of directed sensation meditation. I trained with an Ishaya monk for a year at one point. Bjorn, or Atri, was a great teacher. Before we would do the Ishaya methods we would do these things he called awareness games. For instance, we would feel our left had, then our right foot, then become aware of the person across from us, then the space between us, then the space behind our head. This was a warmup before the Ishaya mantra meditations. I found these awareness games to be extremely powerful, now I think it might have had quite a bit to do with this directed sensation meditation aspect of it. Imagining a flame, or a mandala circle, and focusing on it is using your imagination to come up with an image and direct your attention there. That's one type of directed imagination. There are self development models where you examine the details of a ship that you've imagined. This is the same basic idea. Most visual meditations are done by just imagining something, but some are done by looking at an image of some sort. Many of these mental exercises are used in Psychosynthesis, which is a psychotherapy founded by Roberto Assagioli after his imprisonment by Mussolini in WW2. Directed imagination can be visual like these methods, but mantras are more popular in meditation. A mantra is a set of words that you say. It can be a single word like "life", or it can be a sentence. It can even be a sound that has no meaning, or a set of words that have a meaning that you don't know. Transcendental Meditation is the most famous and popular brand of this type of meditation. Originally the founder promoted any type of mantra meditation and said the words didn't matter. Later he changed it to the words mattering a lot. Now, you pay money to get special phrases that are usually something like the names of various Hindu gods in the Sanskrit language to repeat silently in your head. Most mantra meditations are done silently, but some are done out loud. Some are done as group chants. Notice that this type of directed imagination meditation includes prayer, whether done silently in the mind or out loud, by oneself or in a group. I had a few experiences with meditation classes over a number of years, but nothing ever really happened. Not until I went to a meeting held among friends in a house in Grand Rapids. Atri led the event. He took us through a series of awareness games, then we chose a word and did a silent mantra meditation, I chose "aliveness". That experience was quite profound for me. I had the oceanic feeling and the experience of cosmic consciousness. It's something that's beyond words. I had read several books on this, but I didn't realize what it really was until I experienced it myself. After that I studied the Ishaya method and used their specific mantras for awhile. It was a good experience. It was very good at changing my perception and awareness of the world. But, it seemed to not work that great when it came to intense chronic pain. That's where I made the move from directed imagination meditation to directed sensation meditation and had such good results. Notice that both of these methods are directed. Now we can look at the other side of that coin. Zen is interesting because there isn't one form of Zen meditation, there are many types. But, in one form of Zen you simply feel whatever your body is doing. This is often done in specific sitting positions, and sometimes while walking. Sometimes with the eyes closed, and sometimes with the eyes open. This is also where what is usually called mindfulness falls. It's just being mindful, being aware, of your body as you're doing other things. Notice that you are sensing and perceiving things. Just this realization in the moment will change the experience and your consciousness. People tend to do this naturally sometimes, but I think rarely. It happens when you are laying in bed looking at the ceiling not thinking about anything, just aware of your body. Or when you're walking in bare feet and just notice the sand or grass touching your skin, and then the wind blowing across your body. It can be powerful, but I think it is kind of an odd experience to do, and thus I rarely have done it in a purposeful manner. It would probably benefit me to play with it more. But, I don't think it's a good idea necessarily to always be doing this. Yes, I'm saying that when you are asleep and dreaming you are doing a type of meditation. When you're mind is just wandering around your thoughts in a daydream you are doing a type of meditation. And, when you take drugs to go on a "trip" you are doing a type of meditation. It's just of the non-directed imagination type. Since our imaginations like to wander we don't have to try to do this, it just happens, so we don't associate it with meditation. Dreams are amazing things. It's your mind processing things, making connections, solving problems, symbolically presenting problems to you, condensing and sorting information. You naturally do this while you're sleeping, but you can also do some of it while you're awake. There's actually a gradient rather than a sharp division. People work with lucid dreaming where you try to become aware that you are dreaming and direct the dream. Active imagination is like an intense daydream where you are directing it for psychological purposes. Vision quests are somewhat directed and somewhat free ranging. These are all somewhere between directed imagination meditation and non-directed imagination meditation. The idea of watching and waiting is here too. You don't try to do anything, you just watch your mind and wait for it to calm down. It will eventually calm down, it's pretty incredible. The first experience a lot of people have in meditation really surprises them in how many ideas your mind is throwing up into your conscious awareness, and how you can't stop it, or even control it. If you just watch that crazy process for long enough and keep letting go of what comes up your mind it will eventually clear. I believe Vivekananda promoted that method. You get the feeling of being the observer of your own thoughts. It's a good perspective. Most of the methods are aiming at this same type of result, they are just using a different method to get there. I have a few articles related to the ideas of non-directed imagination. It's common in meditation to limit the input from the environment. So you do it in a quiet place, where nothing is moving, with your eyes closed. But, you can expand beyond that. Atri always emphasized trying to move that meditative state that you achieve in the sessions to the rest of your life, and essentially meditate with your eyes open while you are living. This is the same idea as praying without ceasing. These psycho-technologies, as the psychologist John Vervaeke calls them, are all useful. In some ways they are similar, and in some ways they are different. It depends quite a bit on your personality, your circumstances, and your purposes what will work the best. Even when you find what works I think it can be useful to explore. I find exploration for the sake of exploration fun and engaging, whether that's in the world or in the mind. Either way, it's useful to have this framework to think about what you're doing and what options you have to explore.